Siding with NRDC, a federal judge just rejected the Trump administration’s attempts to fast-track the Keystone XL pipeline — the fossil fuel monstrosity that would carry 830,000 barrels of dirty tar sands oil each day from Canada's boreal forest through America's heartland. This massive pipeline would threaten land, climate, and drinking water supplies, keep us rooted in the dirty fossil fuels of the past, and slow our path to a clean energy future. 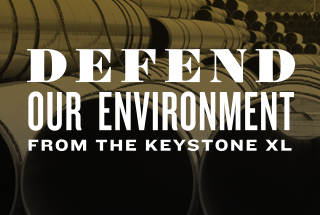 Enough is enough — Keystone XL is all risk and absolutely no reward. Now, the fate of this climate-wrecking pipeline lies with Trump’s State Department. Demand that Secretary of State Mike Pompeo stop the reckless Keystone XL tar sands pipeline once and for all! Tell Secretary of State Mike Pompeo to stop the reckless Keystone XL tar sands pipeline once and for all! Stop the Keystone XL pipeline once and for all! Dear Sec. Pompeo and the State Department: I'm appalled to learn that the State Department was attempting to cut corners and fast-track its environmental review of the Keystone XL pipeline's new route in Nebraska. It's critical that you comply with the recent federal court order and complete a comprehensive Environmental Impact Statement to fully assess the environmental impacts of this disastrous project. Keystone XL threatens land, climate, and drinking water supplies for farmers, ranchers, Indigenous people, and other communities. And the pipeline keeps us rooted in the dirty fossil fuels of the past instead of moving us toward a clean energy future. Enough is enough. It's time for the State Department to stop this irresponsible project once and for all! Thank you.